Where is the Activist Outrage? As to be expected, many activists, like Bob Brigham (surprise! ), are quickly attacking Sen. Baucus and Tester for being silent on the issue of the horrific Newton School massacre. That’s true. They should be coming out and they should be saying they support responsible gun control legislation. That makes sense and it needs to be done. What’s bizarre is that those same activists are completely silent when it comes to Governor Schwetizer’s recent shocking comments. “I don’t want to sound like a terrorist here, but you give me 20 gallons of propane- I can do a lot of damage in a very short period of time,” said Schweitzer during Tuesday morning’s Voices of Montana statewide radio talk show. “If there are evil people they can use guns, or as we’ve seen in Russia, they can also use things like propane. You can use natural gas. Five gallons of gasoline and imagine what can happen. They plan to bring that legislation back, but that actually wouldn’t change anything thing that happened back there in Connecticut in terms of what gun was used and what types of guns could be used. I thought we were past this kind of nonsense. For someone who is constantly celebrated has having a “liberal backbone,” I’m hearing a lot of bogus NRA talking points. It’s time for all politicians to grow backbones and support real, responsible gun control – even in Montana. Someone explain please … Baucus, Tester and Schweitzer are all three Democrats, and Schweitzer, of the three, is a little more flamboyant. All three are basically worthless from a progressive viewpoint. Who was it who said that the best way to control the opposition is to lead the opposition? Democratic leaders have long been right wingers in service of the same agenda as Republicans. I don’t know why that is so hard to fathom, as it is so sensible and easily accomplished. This post seems to indicate that within that right wing fibre there is a split … an anti-Schweitzer fracture? Internecine warfare? Nice to see, but why? You aren’t aware of the baucus vs. schweitzer smack down that is on the way? This is only the beginning. The long knives haven’t even begun to come out. When the musical chairs begin noone wants to be left out of a job. Do you really think BS is going to run against Max? I’m not seeing it. I’ve never commented on one of my post’s or anyone else’s before, but I feel the need to clear. The driving momentum behind my post is that we need more responsible gun control. The second issue is this: why is Schweitzer held to a different standard than Baucus or Tester. Baucus and Tester have been silent on the question of gun control and we, as their constituents, should make some noise about that. Many activists are, but those same activists are giving Schweitzer a free pass for the insensitive (talking about building bombs?) and nonsensical (video games = assault rifles) comments. Well to be fair to Governor BS, our culture is sick on many levels. I dont think you can ‘blame’ video game manufacturers but something is really wrong with our society and while Gov BS maybe didnt really articulate it well he is trying to put a finger on something we all are having trouble defining. You also cant Constitutionally put many more restrictions on guns than we have already and the ones that might be legal are really kind of feeble. The assault weapons ban they are talking about bringing back was in place during the Columbine shooting was it not? I dont know this is pretty bad and has everyone who is thinking and not just talking politics scratching theirhead. Mstorin, commenting on your own blog is one of the privileges. You start a conversation, you get to hammer it out with others. The gun matter is a complicated social phenomenon, with repressed males and exalted violence, bullyism and no public health system to speak of. Politicians have very little to do with it. Why do we even look to them? The remedies must address the illness. I’ve not seen anything definitive aout video games and doubt they have anything to do with it other than act as an outlet for lonely kids. I think Schweitzer was just passing gas. i thnk that Baucus and Tester will say anything that they think won’t harm them. I see but one solution: A social network that identifies outcasts and brings them some attention and understanding. For once I agree. I understand the impetus to do something about gun control now that its in people’s minds, but these massacres have little to do with gun control. The assault weapons ban and restrictions on extended magazines may pass and seem to be pretty reasonable ideas, but as has been pointed out these events happen with or without assault weapons. The most recent shooting happened to use one, but VA Tech killings were performed with handguns with no greater than 15-round clips. The vast majority of shooting deaths happen from handguns, and we’re not going to see a significant fall in the number of shooting deaths as a result of restricting assault weapons. I suspect that the phenomena in question might peripherally involve gun control measures – that is, would the overwhelming impetus to go out an murder people have passed without incident if guns were not immediately available? Could it be that in our history there have been many incidents we don’t know about because lack of firearms means they did not happen? There is a force at work here that is propelling young men to kill people. They are resentful, they have been alienated. But that’s not uncommon, and such kids, with proper attention, often integrate, or go the other way and devolve into alcoholism and other drugs and even Mom’s basement or homelessness, but not massacres. What needs to be understood better is the propelling force that leads to murder. Schweitzer speculates about video games, but I see that as pressure release. Kids have always played with guns. It’s not that anger is released but rather how it is released. I am better off after a physical workout than before. Anger needs to be managed by controlled release. It’s why we have sports. Wish I knew. This incident is so horrible I cannot even bear to look at the names on the front of the NY Times. Absolutely right. I do wonder if, as you suggest, physical activity has something to do with it, if these sorts of indiscriminate violence has some connection to living a more sedentary lifestyle. I wish I could count the times when I was down due to job loss or being dumped by a girl and human interaction lifted my spirits – a night out made a difference. True, when I got home the problem had not gone away, but contact really helped. My future wife and I suffered a breakup, and in desperation I joined a gym and worked my tail off … But getting back together made that difference. Human contact is important, and in that case we decided to get married and those problems are in the past. Psychic release provided by sports helps too. But human interaction has to have top priority. When we are alone too much, we deviate from the norm. Other people pull us back. If memory serves me correctly, Baucus supported the original assault rifle ban. He did the right thing morally, but the wrong thing from the standpoint of political self-preservation. Having recovered from a close encounter with political mortality, he placed morality in a new perspective. James – ALWAYS a source of institutional knowledge! Personally, I do think those violent video games are doing a number on those who play them all the time. I also think that some of the Gov’s comments demonstrate that if he’s serious about a 2016 presidential run he’s going to have to dial things way back in the rhetoric dept. 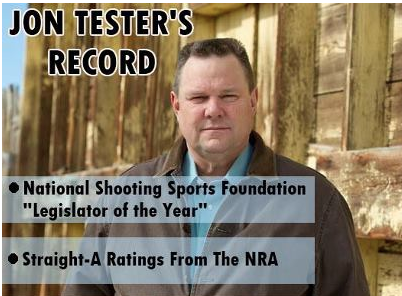 This is just a guess, but I suspect Senator Tester’s silence has something to do with his straight A ratings from the NRA and the fact that he was the National Shooting Sports Foundation “Legislator of the Year.” NRA has been silent until today, when they issued a non-statement statement, and also hinted they were hoping for the Mayan apocalypse, so they wouldn’t have to do the Fri, Dec 21st press conference. TUCSON—The National Shooting Sports Foundation, headquartered in Newtown, Connecticut just three miles from the Sandy Hook Elementary School has a long history of extremist positions on guns. It has opposed even the mildest policies designed to protect people from lead poisoning and to fund the confiscation of guns from criminals and the mentally ill.
“By law, Roy Perez should not have had a gun three years ago when he shot his mother 16 times in their home in Baldwin Park, Calif., killing her, and then went next door and killed a woman and her 4-year-old daughter. Currently, the Foundation is pushing legislation to ban the Environmental Protection Agency from eliminating highly toxic lead in bullets, even though non-lead bullets are readily available. Though state and federal agencies have warned hunters of the potential danger—especially to pregnant women and children— of ingesting the tiny fragments of lead from bullets which are common in the meat of hunted animals, the Foundation is aggressively seeking to amend the federal Toxic Substances Control Act to prevent the EPA banning lead in bullets as it has banned it in paint, gasoline and children’s toys. Elimination of lead from bullets would prevent up to 14,000 tons of this toxic heavy metal from being shot into America’s forests and fields every year, where it poisons millions of birds and mammals to death. So, we’ll let BS off the hook, but not Jon because he’s hurt your feelings so many times? Poor guy. I offered some views on what the Gov said. Baucus and Tester will have far more to do with the upcoming federal assault weapons ban debate/legislation, so it seems important to consider their past views on the issue, especially since they don’t seem to be making public statements. Mother Jones put together this interesting chart of sorts…..
Schweitzer’s actually on to something because the biggest mass murder involving a school was in Michigan in 1927 when a guy who lost an election (sound familiar?) used his knowledge and easy access to sophisticated explosives to blow up a grade school. Of course our government back then did the right thing and clamped down on explosives. Perhaps you are unaware of the efforts to ban copper as well as lead. In both Washington State and California, there is a ban on the use of copper in vehicle brake pads. Copper is used to dissipate heat. The reasoning for the ban is that copper is toxic. Now when it comes to bullets there are copper alloy bullets, lead only, copper/tungsten, and lead/copper. There is no other reasonable metal to perform the function. If both lead and copper and banned, that will be the end of big game hunting with bullets. I’m not going to argue with your call for sensible gun control that only deals with cosmetics. This is not a small point. When you write of “gun control”, it stands as something of a lie. You are not interested in controlling guns, but rather people, who can have them and how they can use that tool. Ironically given this post, that is no different than ‘controlling’ who has access to video games and what kind of games they can play. The kind of control you seem to demand has been ruled time and again as anti-Constitutional. What you want to be discussing is regulation of sale and use, just like we have with cars, fertilizer and Sudafed. If you will accept a suggestion, I would and will be using the phrase ‘sensible firearm regulation’. I don’t think the Governor’s comments could really be described as ‘shocking’. They are pretty standard for NRA types – guns don’t kill people, people do. He may not be right, but it’s not a shock by any stretch of the imagination, and at least in one respect he is correct – there is little evidence that massacres of this nature can truly be diminished by laws restricting access to assault weapons. Um, Storin, there’s a big world out there, and YOU AIN’T IN IT! Schweitzer is right on with his comments. Belive me. I have actually SEEN what a five gallon propane tank can do to a house. OBLITERATE IT! And once, in Canada, some guys were filling a hot air balloon when the tank exploded. THAT explosion was perhaps greater than anything I saw in Nam, except for perhaps a bomb dump being blown up. THAT one knocked me over! From miles away! It ain’t about guns. It’s about mental illness in this particular case. Ronnie Reagan took away ALL funding for mental health. As a result, all the people that needed mental help ended up in JAIL! Try some time to get mental health care. It doesn’t exist. Schweitzer speaks the TRVTH. That’s all. It’s hard for some folks to accept.